The Park Office is located in a white and blue mobile home a few lots up on the road behind the Marina Store. 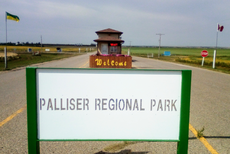 All patrons are welcome to drop in for a visit, or to discuss concerns or issues related to the park. The coffee is always on! A warm welcome from our Park management team! Geraldine continues to run the operations of the park for the 2018 season. Stop by and say hi if you can catch her in the office! We welcome your feedback and look forward to offering you the best summer experience!